I am being forced to upgrade from Windows 7 to Windows 10 by Windows! Please see the screen shot. I didn't accept to upgrade. I do not want to upgrade. I did not click anything to upgrade. I am happy with Windows 7. So, basically this is a forced upgrade! I tried to "task manager close" this update window but it just reappears moments after. I don't see any other options other then "update it now or update it later at a specific time (which can not be changed). Last night Windows automatically just started upgrading to Window 10. It didn't ask me if I wanted to. I didn't click on anything to upgrade. Nothing. In fact I stepped away from the computer but saw the upgrading in progress screen. It just tarted an automatic upgrade. After about 20 - 30 minutes when it upgraded, tried Windows 10 and don't like it. My video card acts weird on it. My screen flashes even after its fully installed and rebooted. I like my widgets that show my GPU, CPU, RAM and HD usage in real time so I know what's going on with my PC. Widgets are not allowed in Windows 10. I know a lot of the commands and locations for things in Windows 7 and I don't want to have them again. I have a feeling that more of my hardware is going to have an issue with Windows 10. After all these problems, I actually did a system restore to get Win 7 back last night. Now, today (less the 24 hours after the automatic upgrade) its forcing me to upgrade again by only giving me two options (both of which are to upgrade). I may upgrade to Win 10 in a few years, but I don't want to be forced to do so now. Microsoft has been offering Windows 10 for free for a while now. If I had wanted it, I would have gotten it. I have seen the little window pop up saying "upgrade now for a limited time" almost daily. I see the advertisements on MSN's homepage to "upgrade now". Shouldn't it be my choice not forced if I want to upgrade? They are only giving me two options, both of which is to upgrade right now or in a few days. No option to "not upgrade" or "leave me alone"
I am frustrated about this. Any suggestions? The window to update is up right now as we speak. This will be a first. I've seen the download appear and the offers but never a forced upgrade. In reply to: This will be a first. Wont let me add picture in here but here is the link to my other thread on the Windows forum. This has my screenshot. I think its this screen. But that's the screen after I accept the W10 upgrade. I've seen folk claim the upgrade is forced but that screen is after we answer we're going to 10. Did you try Alt+F4 on that screen? In reply to: I think its this screen. Ah, I see. I am pretty sure you can turn this off with Windows Task Manager. Might take some playing to learn which process controls it. After you turn it off, go right to Control Panel, and choose how Windows manages updates. I clicked Choose how Windows can install updates, then chose in the dropdown on imortant updates, Never check for updates (not recommended). That fixed Windows! You might try changing that setting even without changing the process; try and see if it'll let you. That stupid process could conceivably just disappear. I think it's this screen. Also I recall that's the screen AFTER we are asked if we are going to 10. In reply to: I think it's this screen. I never clicked on anything to upgrade to Windows 10. This screen randomly automatically came up with nothing really to back out of it. Just like yesterday that randomly automatically started the update even though I was away from my PC. 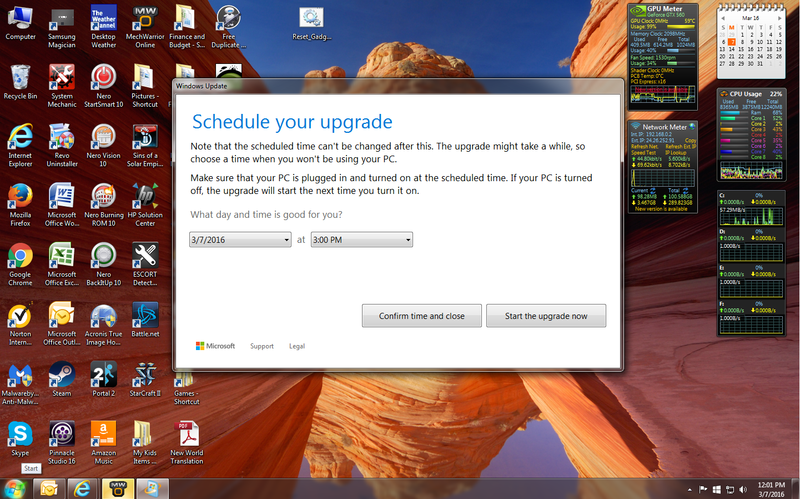 You can see from the screen shot, they are giving me the option to upgrade, without the option to not upgrade. If I wanted Win 10, I would have upgraded in the many months they have been offering it for free. I've been staying clear of the Microsoft popup windows that come up asking me to upgrade. Cant find a way to get out of upgrading at this point. I wonder if this is happening to a number of those of us who have refused to upgrade at this point. I see there's some news about this. It appears if you have Windows Update set to install recommended updates you get this. THIS IS BREAKING NEWS. MORE TO COME LATER. For now, you prepare for a do-over and save your files, have your recovery media at the ready if no quick fix is found. I will write I am moving all our PCs at home and office to 10. It's working that well for us. In reply to: I see there's some news about this. I do have Windows set to "install recommended updates" automatically but this option is to reasonably install updates to Win 7 (to keep my current OS working and secure), not to install a completely new operating system. As I said earlier, I tried Win 10 but was having issues with it. Plus Win 10 takes away some things that I actually really enjoy and know about with Win 7. So the choice was to give Microsoft the option here? It may be upsetting but if you let Microsoft choose, what do you think they'll install? It is a shame that one has to resort to hacks to not have to get something. I sometimes wonder how one would come to know (in advance) about the change from optional to recommended, or the ability to rollback (within 30 days) to the original OS. If I didn't spend part of my days reading news, I might have found myself in the same boat.. ← That's IF Google or a Duck afforded me no joy. Some have partitioned their hard drives to allow for more than one operating system. Sometimes called dual boot. When it starts up, you select with system that you want to use. If you don't like 10, just use the emergency disk and re-install the image on the hard drive. In reply to: Going backwards. The mobie is called "Groundhog Day" I believe. Feels sort of like Obamacare. oneclickplus.....excellent comparison!!! And as for the rest of the posting, I'm checking my update status now.....I don't want Windows 10 either! I think Obamacare is great. When did this become a political forum? But you need to change your Windows update to "never check"
After that, uninstall all these updates. Many are updates that harvest data from windows 7. After all this just run windows update once a month and just download the security updates. Quit whining about how MS is abusing W7. They don't seem to care about your troubles or anyone elses. Take control of your PC and change your WU settings and move on or go ahead and install W10. In reply to: No hacks needed. Thanks for the links and assist. Until last week I hadn't seen this happen. Times change, and you are in a new land with new rules and skies. While my 10 experiences are now in the dozens, all good, that's not good enough to force folk to change. This should be voluntary. You don't have the right to just select which updates you want if you download any from Microsoft. What you would have to do is to get notified about the updates available. You then have to research the update to see if it requires the upgrade to Windows 10. This is the decision that you have. You won't be able to stay on 7 forever or you will have so many tech issues that it will place all of your information and programs at risk. But it is your decision to update or not. You may be able to update selectively but it will be harder and harder. Once you get past the one year free upgrade, it will cost you at least 100 dollar to get it in the future. Other idea would be to partition your computer to dual boot 7 and 10 both. Then you can select which you want to use and bypass the dollars but it still has its problems. Look Microsoft makes their money by selling software. This is one of the reasons that they have different versions. Sometimes it is to improve the program and sometimes it just dollars and cents. If MS needs you to update to make money, then why is windows 10 going to be the last OS update, with only forced changes in the form of upgrades you cannot refuse?. This only says one thing to me, the OS will become like Office, and leased to computer owners wishing to continue using Microsoft, with a pay without choice system, this is a typical attitude of how the corporate gangsters behave now, and it will be a financial nightmare for small businesses who rely on a number of computers to survive. Already I have refused the 10 upgrades for my recording, and sound studios after running one test rig, because it deleted drivers for hardware MS decided was old, and is no longer supported by the manufacturer. I may be considered old fashioned, but as far as I and my fellow engineers here are concerned, the more modern digital tech gets in the music industry, the greater the loss of the traditional sound, so it stands to reason, when you have what you consider is the best sound you can get for your use, you do not want to abandon what you have; not to mention the massive cost of having to change everything all because someone like Microsoft, who, is in bed with Intel, and together try to make you upgrade everything when they tell you, and not when you want. MS is losing its hold over the computer market, and no wonder, with the massive failures they have had with some of their previous editions. I realise many will disagree with me, but we are all entitled to our opinion. Whatever you think, Microsoft, and any other company has absolutely right to force you to do anything against your will, because they want to control, and spy on you, and Windows 10 is riddled with spy and tracking software embedded by MS, that will be used to manipulate the way you think commercially. I will do what most music and graphics people have done when MS makes it impossible for me to use their product, I'll go Apple. someone showing how he uses it to mix channels. This shows it being done in an earlier version 11, using Jack, but Audacity is usually available too. I hate to say this, but ever since there were "drivers" back in the earlier days of Windows, you did NOT always get a choice as to whether or not you had to upgrade drivers when moving to an OS. A driver is NOT a program. That is, it is not a "something.EXE" file. It is interface software between the OS and the device itself. If you bought a newer version of your device, you MAY have had to change to a newer driver. If you upgraded your OS, you MAY have had to upgrade your driver. That is, the driver has to be compatible on both ends. Suppose you replaced Win 7 with 64-bit Win 7. Guess what? You most probably would have to change to a 64-bit version of the driver. Without upgrading the driver, you would probably wind up with a very BLUE screen. Win 10 is NOT new at this. Microsoft is taking steps to move to a subscription business model. It hasn't happened yet, though. I like to keep all my options open. I have legal Windows 7 licenses for my computers and I have legal Windows 10 licenses. If I have to stop letting those computers get on the internet, so be it. I can buy a Chromebook for that later. Ye olde sneakernet works just fine for anything I need to transfer to the Chromebook for uploading. is there an easy way (sneakernet?) to transfer my favorites from my roommates windows to my chromebook? do i have to buy something? C'mon... "sneaker-net"... think about it.